Please note: usually takes one week to deliver. 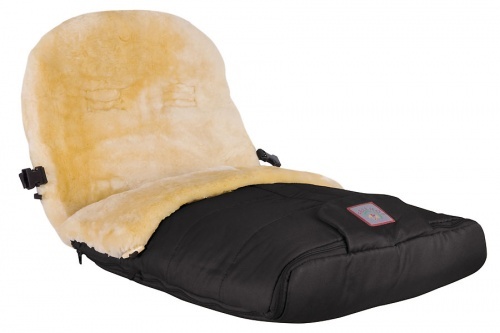 This 100% lambswool pram footmuff will keep your baby snug and safe when you are out and about. It's so versatile too - it can be zipped open and used indoors as a sleeping or play mat. For additional comfort there is a zipper down the front of the footmuff and an opening at the bottom to if you need to keep dirty shoes out. Made from 100% lambswool inner; the upper and the lower part are zipped together and can therefore be separated easily, allowing the lower part to be used as a sheepskin liner. There are pre-cut holes for the harness and are suitable for any pram or buggy with a universal 5 point harness (most pram types). Lambswool gives your baby natural air conditioning - no freezing in the winter and no sweating in the summer! Your baby instead lies on soft natural fibres, which form an air cushion and give a constant circulation of air. The Lanolin in the wool has antiseptic properties and is gentle on the skin. Due to its natural antiseptic and self cleansing properties, it only has to be hung in fresh air between uses. You can also wash it at 30 degrees occasionally if it gets soiled. The CORTINA is suitable for almost all pram models. Machine-washable (30°C). It is recommended to use a ph-adjusted wool-detergent, we have some for sale here. Please do not tumble dry or hang the pelt on radiators or expose to direct sun. Machine of hand wash at maximum 30°C / 95°F, wash with mild detergents, wool washing detergents or our special labskin-shampoo. Do not use detergents containing enzymes. Spin to remove excess water. Dry on a line or dry flat. Stretch to shape while still damp. Do not dry in direct sunlight or artificial heat. Always allow lambskin to dry slowly. Do not tumb dry. This was such a great purchase. I am now using it for my second baby and will be passing it on to my brother’s babies. It keeps baby cosy and warm. I wanted a natural product that wasn’t like the sweaty polyester footmuffs that are in all the shops. And it’s also been washed in the washing machine several times (reflux babies!) and comes out curly haired but just as soft!! This is the ultimate luxury for your child to keep them snug and content especially in all weathers. The quality of the lambswool and the fabric is out of this world the pictures don't do it enough justice. It's thick and plush and looks so comforting! It's well worth it's price and it's multifunctional. The service from earthmother was also fantastic so it's a massive thumbs up from me. I received the lambswool foot muff this week and it's fabulous, can't wait to put our little one in it when he/she arrives in a few weeks . So cosy and fits my buggy perfectly. Thanks 'Earthmother ' for the excellent service also . This footmuff is beautiful and so cosy. Our little boy sleeps in it so well. It also makes our old chunky double buggy looks much more luxurious that it is  Great purchase. This footmuff is gorgeous - even nicer than I was expecting. Excellent quality, large (will easily last till my little one is 3 or more) and super soft and cosy. Delivery was fast and efficient - I couldn't have asked for a better service. Thanks Earthmother, I'll be back again! Received a personal email from the store which I thought was lovely. Really prompt service & delivery. This product is perfect for winter mornings. It is gorgeous & exactly what I wanted. I looked for one of these for so long with no luck in any Dublin shop! Thank you earth mother. The product is extremely good quality, I love it. Keeps my daughter warm in any weather during the winter. The customer service from Siobhan is outstanding. I will definitely come back as a customer. Lovely footmuff. Outstanding quality. Very happy with the purchase. Thank you very much.